Colleen has been teaching group exercise classes for 3 years, getting her start with a Les Mills Body Pump certification. She grew to love fitness classes while attending Drexel for her undergrad degree in Graphic Design, and as soon as she graduated she became an instructor because wanted to share her love of group ex with others. She is known at the Drexel gym for her “Motivational Mondays”. 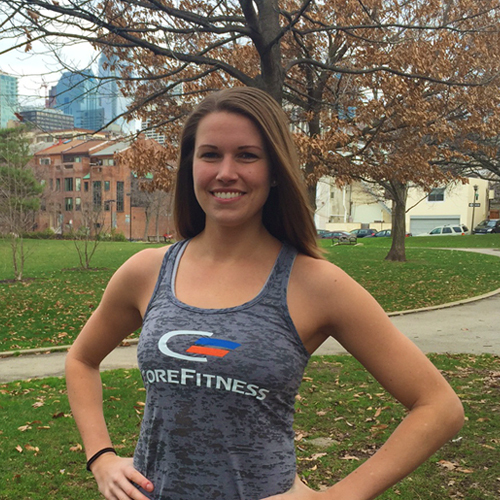 Early in 2015, Colleen received her ACE (American Council on Exercise) certification so now she can expand her expertise as a fitness instructor beyond Body Pump. Outside of working as a Graphic Designer at the University of Pennsylvania, teaching classes at CoreFitness and Drexel University, she enjoys running and has competed in many distance races from 5K’s up to a full marathon, trail races, and a mud-obstacle run. Colleen believes fitness should be a part of everyone’s daily lifestyle, and hopes to encourage people to get up, get moving, and have fun! She has grown to love burpees, and you can bet she will include them in as many classes as she can!